This unique collection of essays, accompanied by a pioneering DVD, at last brings a dazzling view of the literary, social, and performative aspects of American Sign Language to a wide audience. 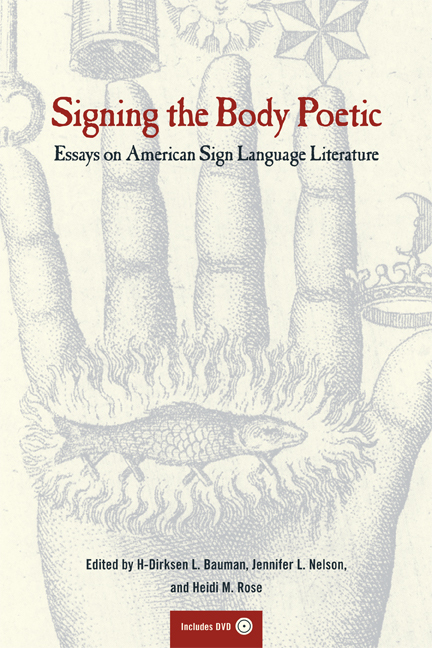 The book presents the work of a renowned and diverse group of deaf, hard-of-hearing, and hearing scholars who examine original ASL poetry, narrative, and drama. The DVD showcases the poems and narratives under discussion in their original form, providing access to them for hearing non-signers for the first time. Together, the book and DVD provide new insight into the history, culture, and creative achievements of the deaf community while expanding the scope of the visual and performing arts, literary criticism, and comparative literature. H-Dirksen L. Bauman is Professor in the Department of American Sign Language and Deaf Studies at Gallaudet University. Jennifer L. Nelson is Professor in the Department of English at Gallaudet University. Heidi M. Rose is Associate Professor in the Department of Communication at Villanova University.